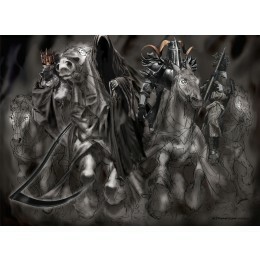 From Revelations Chapter 6, Verses 1-8 the Four Horsemen of the Apolcalypse upon their white, pale, red and black horses. My Four Horsemen are depicted from left to right--Pestilence with his Bow & Crown, Death with his scythe, War and his flaming Sword and Famine with his Scales, which is how food was measured. What can I say, I wanted them to rock and still depict the quote as seen in Revelations.